Many students find it difficult to navigate social situations and connect with others, especially when it comes to their peers within professional and educational settings. This sometimes prevents them from making friends and connecting with colleagues, and can have deeply affect their ability to engage in group activities or projects. Counselling services staff at the University of New Brunswick’s Fredericton campus hope to change that. 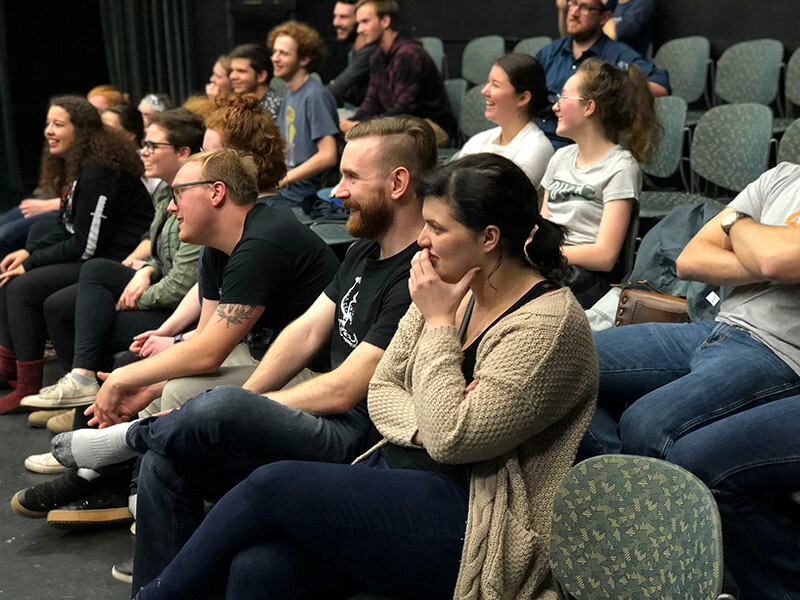 A new improv class was first offered last fall, where students had the opportunity to learn improvisational theatre in a structured and safe environment. Matthew Maclean, mental health strategist at UNB, initially recommended the use of improv classes as a way to help students build confidence when interacting with others. “One reason this program is so important is that, in everyday life, we don’t really get opportunities to play and explore with social behaviour because it seems like every social interaction is potentially of great consequence,” says Mr. Maclean. The improv workshops are run by Hot Garbage Comedy, an improv company based out of Fredericton and Toronto. The next session of improv begins on Jan. 14. The classes run for three weeks, from 6:30 – 7:30 p.m.
For more information or to register, contact Counselling Services at counsel@unb.ca or 453-4820. Photo: L-R: Duncan Chalmers, Derek Smith and Kat Hall participate in a new improv workshop offered on the University of New Brunswick’s Fredericton campus. Credit: Arianna Martinez.